2004-12-16 Application filed by Chippac, Inc. filed Critical Chippac, Inc.
A module (40) having multiple die includes a first die (214) on a first substrate (120) and an inverted second package (202) stacked over the first die (214), with, where necessary, provision is made for a standoff between the second package (202) and the first die (214). Also, methods for making the module include steps of providing a first package having a first die (214) attached onto an upward facing side of a first package substrate, and stacking an inverted second package (202) over the die on the first package, provision being made where necessary for a standoff between the second package and the first package die to avoid damaging impact between the downward-facing side of the second package and wire bonds (216) connecting the first die (214) to the first package substrate (120). 35 package is a DSP, it may be impossible in practice to test the DSP until after it is placed on the substrate; and where the DSP is wire bonded it may be impossible in practice to test the die on the substrate because the handling during testing causes damage to exposed wires. In a conventional stacked die package, therefore, the upper die must be stacked over the lower die before the lower die can be tested, and where the lower die proves at that point in the,, proces to be unacceptable, the stacked package must be discarded, resulting in a waste both of the spacer and the upper die and of processing steps for stacking them. Another limitation in stacked die packages is the low power dissipation capability of the package. The heat is transmitted from one die to the other and the only significant path for heat dissipation out from the package is through the solder balls to the motherboard. Conduction of heat to the ambient through the top of the package is very limited because the molding compound typically does not conduct heat well. FIG. 1 is a diagrammatic sketch in a sectional view illustrating the structure of a conventional stacked die package having two die stacked with a spacer between them. The stacked die package, shown generally at 10, includes a first die 14 attached onto a substrate 12 having at least one metal layer, and a second die 24, stacked over the first die 12, the first and second die in the stack being separated by a spacer 22. Any of various substrate types may be used, including for example: a laminate with 2 - 6 metal layers, or a build up substrate with 4 - 8 metal layers, or a flexible polyimide tape with 1 - 2 metal layers, or a ceramic multilayer substrate. The substrate 12 shown by way of example in FIG. 1 has two metal layers 121 , 123, on opposite sides of a dielectric 120, each metal layer being patterned to provide appropriate circuitry and connected through the dielectric by way of vias 122. 15 control, and the planes of the adjacent die may be not be parallel. In some such approaches the spacer adhesive is filled with particles having a dimension suitable to provide the standoff between the die and to prevent die tilt. Various spacer adhesives are described in, for example, in U.S. Patent No. 6,472,758 and U.S. Patent No. 6,340,846, each of which is hereby incorporated herein by reference in its entirety. 15 stacked. As a result the final stacked multi-package module yields can be maximized. While "naked" die can be tested, testing can be more readily carried out in the package, particularly where the pad pitch on the die is very small. SUMMARY  This invention is directed to multiple chip modules ("MCM"), including a bottom 30 (lower) package, and an inverted top (upper) package stacked over a die on the bottom package. Generally, rather than having an upper die stacked over a lower die, as in a stacked die package, an inverted upper package (such as a land grid array package) is stacked over the lower die, with provision where necessary (such as by a spacer) for a standoff between the upper package and the lower die. The standoff or spacer, where provided, physically 35 separates the upper package from the lower die; as a consequence, the lower die can be wire bonded to the lower substrate, and z-interconnect can be made by wire bonding between the upper package substrate and the lower package substrate (or the lower die). The MCM according to the invention can be built using existing manufacture infrastructure as employed in die stacking with provision for spacing between adjacent die. According to an aspect of the invention, a package such as a land grid array ("LGA") package is inverted and stacked over a ball grid array ("BGA") package. The BGA package includes at least one die mounted on a substrate. Where the lower package die is connected to the lower substrate by wire bonds a spacer can be affixed onto the upward facing (active) side of the die; and the inverted package is affixed onto the upward facing side of the spacer. Z-interconnection between the inverted package and the BGA package in the MCM is wire bond based; that is, wire bonds connect z-interconnect wire bond pads on the upward facing side of the inverted upper (LGA) package with pads on the die itself on the lower (BGA) package, or with z-interconnect wire bond pads on the upward-facing side of the lower (BGA) package substrate, or both with pads on the lower package die and with pads on the lower package substrate. Generally, the invention features various configurations of various such stacked packages, having an inverted LGA package stacked upon a die on a BGA package, and methods for stacking and interconnecting the various packages by wire- bonding based z-interconnection. In various aspects of the invention the connection of the upper package die and the upper package substrate can be by flip chip or wire bond interconnection; the inverted upper package can include any of a variety of LGA packages, such as a laminate or buildup substrate-based LGA or a tape-based LGA, and/or any of a variety of "QFN" packages or bump chip carrier ("BCC") packages; the inverted package can include one die or can include two or more die, and where two or more die are included in the inverted package the die can be stacked or they can be arranged side-by side on the inverted package substrate; the lower package can include one die or can include two or more die, and where two or more die are included in the lower package the die can be stacked or they can be arranged side-by side on the inverted package substrate, and where the lower package is a stacked die package the inverted package is mounted over the uppermost one of the stacked die; the package stack can include one or more packages having a flip chip die bonded either to the top or to the bottom of the BGA or LGA; the package stack can include a thermal enhancement feature enabled by a heat spreader over the upper package; and the stack can include any substrate, laminate or build-up or flexible or ceramic, provided that the z-interconnect pads are made available for bonding on the periphery of the packages. In one general aspect the invention features a multiple chip module having stacked first (lower) and second (upper) packages, each package including a die attached to a substrate, in which the upper package is inverted, and in which the upper package is stacked over a die on the lower package with provision for spacing between the upper package and the lower package die. Because the die and wire bonds on the lower package are not encapsulated before the upper package is stacked over the lower die, the spacing is provided to prevent damage to the wire bonds connecting the lower die to the lower package substrate. Accordingly, the thickness dimension of the spacing is determined according to the loop height of the wire bonds. The invention provides for excellent manufacturability, high design flexibility, and low cost to produce a multiple chip package module having a low profile and a small footprint. The wire bond z-interconnect is well established in the industry; it is the lowest cost interconnect technique and it is directly applicable, without significant modification, to the stacked multiple chip modules of the invention. It provides design flexibility to the relative size of the BGA to LGA that can be bridged by wire length. Using available techniques and equipment the wire in a wire bond can be as short as 0.5 mm or as long as 5 mm. The arrangement of the z-interconnect pads can be implemented through either or both BGA and LGA substrate designs. Moreover, using wire bonds according to the invention z-interconnect can be formed between pads that are not precisely aligned over one another, by employing so-called "out of sequence bonding" that is in current use in the industry. The wire bonding pitch is the finest available technology in the industry at 50 microns currently, and projected to go to 25 microns. This is finer than any other interconnect including flip chip (around 200 microns) or solder balls (at about 500 microns), and therefore provides for more interconnects between packages (z-interconnects) in the same available space. Wire bonding using a wire bonding machine provides design flexibility for interconnecting pads, because the connections are programmed in the wire bonder, avoiding the need for hard tooling substrates to match each other and connect with solder balls. When the relative BGA and LGA package sizes change, the wire bonding can be reconfigured to accommodate the differences by program changes. If the top package must be smaller than the bottom, wire bonding can accommodate size differences at least up to 9 mm. This allows for use of the smallest package needed to accommodate the chip size, and thus optimizes the total cost of the MCM. Wire bonding can interconnect pads that are "out of sequence," that is, not situated in the desired order and not precisely above each other in either package, so long as they are not too far apart. Where necessary, the pads can be appropriately routed to a location close enough for wire bonding. This flexibility allows stacking of packages that do not have the "desired" order or location of interconnect pads. As the chip technology advances usually the chip size shrinks and design variants are developed with either more connections or some connections with different order. The bonding flexibility provided by wire bonding allows the user to maintain the same package size but vary the substrate design. This results in lower cost and faster time to market, both critical for new products. The BGAs and LGAs, including chip scale packages, are standard in the industry, providing the lowest cost and the widest availability. This provides significant flexibility in selecting the packages to be stacked and, therefore, in the kinds of functions that can be integrated into the MCM according to the invention. 5  A typical LGA thickness is 0.8 mm. 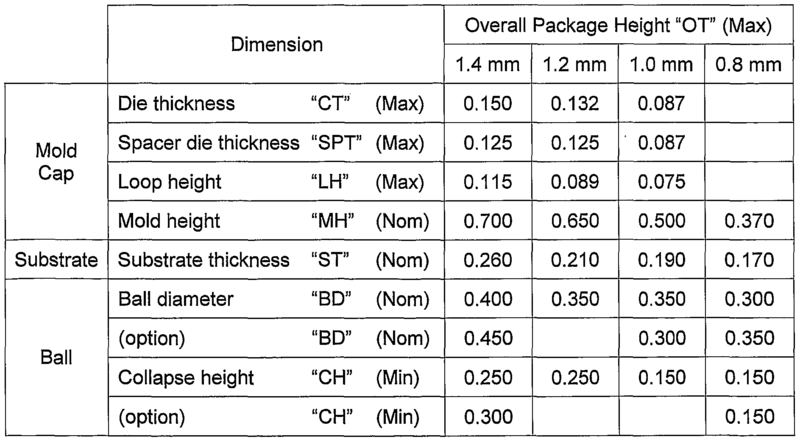 A typical die thickness can range from less than about 0.09 mm to about 0.15 mm, and a typical silicon spacer ("dummy" die spacer) thickness can range from less than about 0.09 mm to about 0.125 mm. The stacking of the spacer over the lower die and of the inverted LGA over the spacer according to the invention can be completed using an adhesive having a finished thickness in the range 10-50 microns. 35 bonded to the upper package substrate and/or to the lower package substrate. In one general aspect the invention features a multi-package module having stacked first ("bottom") and second ("top") packages, the first package being a BGA package having a die attached to a substrate, and the second package being an LGA package, including a die attached to a substrate, in which the second package is inverted so that the substrate surface to which its die is attached is downward-facing, and in which the inverted package is affixed over the first package die, with provision for spacing between the first package die and the inverted second package. In some embodiments the second package is an LGA package, and in some embodiments the second package is a saw-singulated package, and it may be a chip scale package. In some embodiments the second package has a tape-based package substrate. In some embodiments the second package is a bump chip carrier package. In some embodiments the second package is provided with a heat spreader, and an upward-facing surface of the heat spreader is exposed to ambient at the topmost surface of the MCM. In some embodiments the heat spreader can be affixed to the upward facing surface of the topmost LGA package or, where an additional die is provided on the second package, the heat spreader can be affixed to the upward facing surface of the topmost die, and where the inverted second package is the uppermost package in the module the heat spreader can be affixed to the upward facing side of the inverted second package; in other embodiments the heat spreader is not affixed to the topmost package or die but is molded in at the topmost surface of the MCM, and in these embodiments too the heat spreader is exposed to ambient at the topmost surface of the MCM. Heat dissipation may additionally be enhanced by employing an electrically nonconductive heat-conducting molding for the module encapsulation. In another general aspect, methods for making multiple chip package modules according to the invention include providing a first package having a first die attached onto an upward facing side of a first package substrate, and stacking an inverted second package over the die on the first package, provision being made for a standoff between the second package and the first package die to avoid damaging impact between the downward-facing side of the second package and wire bonds connecting the first die to the first package substrate. According to the invention, the inverted upper package can be an array molded and saw-singulated package or a cavity-molded and punch-singulated package; the lower package, on the other hand, is not molded prior to stacking the upper package over the lower package die. The package module according to the invention is molded following stacking, and the MCM accordingly can be array molded and saw singulated, or, it can be cavity molded and punch singulated. The invention provides for modules having more than one chip in a thin package having a minimal footprint. Modules according to the invention can have thickness profiles of, for example, about 1.2 mm or 1.4 mm, or other profiles accepted as standard. Standard packages can be used for both the bottom and top packages. The top package can be assembled for example as a cavity-molded and punch singulated land grid array (LGA) package or as a standard saw singulated LGA package having a laminate substrate, for example, or as a QFN package, or a tape-substrate-based LGA package, or "bump chip carrier" (BCC) package, for example. FIG. 1 is a diagrammatic sketch in a sectional view showing a portion of a conventional stacked die package. FIG. 2 is a diagrammatic sketch in a sectional view showing a multiple chip package according to an embodiment of the invention, having a lower BGA package with a spacer over a wire-bonded die, and an inverted LGA package stacked over the spacer on the lower package die. FIG. 3A is a diagrammatic sketch in a plan view showing the upward facing side of a bottom package in a multiple chip package according to an embodiment of the invention. FIG. 3B is a diagrammatic sketch in a plan view showing the downward facing side of a top package in a multiple chip package according to an embodiment of the invention. FIG. 4 is a diagrammatic sketch in a sectional view showing a multiple chip package according to an embodiment of the invention, having a lower BGA package with a spacer over a wire-bonded die, and an inverted LGA package stacked over the spacer on the lower package die, and having a heat spreader affixed onto the upward facing side of the upper package. FIG. 5 is a diagrammatic sketch in a sectional view showing a multiple chip package according to an embodiment of the invention, having a lower BGA package with a spacer over a wire-bonded die, and an inverted LGA package stacked over the spacer on the lower package die, and having a heat spreader molded into the module over the upper package. 5 by wire bonding to the LGA package and the lower BGA package substrate. FIG. 8 is a diagrammatic sketch in a sectional view showing a multiple chip package according to an embodiment of the invention, having a lower BGA package with a spacer over a wire-bonded die, and an inverted LGA package stacked over the spacer on the lower package die, and having a flip chip die mounted upon the inverted LGA package. .5 may be referred to as the "upper" surface, and the metal layer on that surface may be referred to as the "upper" metal layer, although the MCM and, consequently, the die attach surface need not have any particular orientation in use. The terms "upper" and "lower" and "upward" and "downward", and grammatical variants of these terms, are used herein in the context of the MCM as appearing in the FIGs. 0  In the bottom BGA package of FIG. 2 the die 214 is wire bonded (wires 216) onto wire bond sites on the upper metal layer 121 of the substrate to establish electrical connections. The connections to the die are exposed at the periphery of the package with pads on the top metal layer of the substrate and available for connecting with wire bonds as described in more detail below with reference to FIGS. 3A and 3B. The physical location and 5 order of these pads is arranged so as to approximately lie under the equivalent pads on the LGA situated above. Solder balls 18 are reflowed onto bonding pads on the lower metal layer 123 of the substrate 12 to provide interconnection to underlying circuitry of, for example, a motherboard (not shown in the FIGs.) of a final product, such as a computer. Solder masks 125, 127 are patterned over the metal layers 121, 123 to expose the underlying metal at bonding sites for electrical connection, for example the wire bond sites and bonding pads for bonding the wire bonds and solder balls. D and - where a solid spacer such as a dummy die is employed - the footprint of the spacer must be small enough that it does not contact the wire bonds at or near the die pads. Where the spacer is a solid piece, such as a dummy die, it is affixed onto the upward facing surface of the die using a die attach adhesive of a type that has a soft filler, such as Teflon particles, that will not damage the circuitry of the die. SO encapsulant 27. In the stacked package embodiment of FIG. 2, the z-interconnect pads on the respective package substrates are arranged on upward facing metal layers near the margins of the package substrates. The location and order of the z-interconnect pads are generally arranged so that the z-interconnect pads on the top package substrate approximately overlie5 the corresponding z-interconnect pads on the bottom package when the packages are stacked. Conveniently, the top package has a smaller substrate footprint than that of the bottom substrate, to allow clearance for the wire bonds without electrical shorting to the edges of the metal layers of the substrates. The arrangements of the z-interconnect pads on the upper and lower substrates are shown by way of example in diagrammatic plan view in FIGs. 3A and 3B. 30 example in FIG. 2 has two metal layers, each patterned to provide appropriate circuitry and connected by way of vias. The die is conventionally attached to a surface of the substrate using an adhesive 213, typically referred to as the die attach epoxy. The die is referred to as being attached to an upper surface of the package substrate, it being appreciated that the package need not have any particular orientation in use. According to the invention, the top5 package is inverted, that is to say, it is attached upside downward and downside upward. Because the upper LGA is inverted in the module, so that it is relatively speaking upside-down or downside-up, the surface of the upper LGA to which the first die is attached, which would customarily be termed the upper surface or upper side of the LGA substrate, is referred to in the text herein as the downward or downward facing surface of the inverted LGA; and the opposite surface, which would customarily be termed the lower surface or lower side, is referred to in the text herein as the upward or upward facing surface. 5 encapsulation (27 in FIG. 2) is formed, to enclose and protect the z-interconnect wire bonds and to provide mechanical integrity to the completed module. Accordingly, the module includes a molded upper package within the module molding. As shown by way of example in FIG. 2, the module may itself be saw-singulated; alternatively, the module may be individually cavity molded rather than saw-singulated. 0  Solder balls 18 are then attached to the underside of the module, using standard materials and process. Solder ball attachment can be done prior to singulation of the modules, on the whole strip or array, using the same or similar tooling used for making standard CSPs. Then the modules are singulated from the strip or module using standard techniques, to form the modules having standard CSP formats. 5  As noted, the structure allows for stacking of a fully packaged and tested die onto another die in a standard CSP format. The top LGA containing one or more die can be tested to be "good" before stacking it in the MCM; LGA not testing as "good" are discarded prior to stacking, thus reducing waste of "good" materials and avoiding unproductive processing steps on materials that are not good. D upper package substrate has exposed electrical features on the upward facing ("lower") side. Usually the top heat spreader is affixed to the top package before the molding material is injected for the MCM encapsulation (MCM molding). The periphery of the top heat spreader may be encapsulated with the MCM molding material 427. The MCM molding 427 may optionally be thermally conductive (electrically nonconductive). :0 module. The periphery of an unattached top heat spreader, whether it is thicker in the center or has a simple planar configuration, can be encapsulated with the MCM molding material 527. as in the attached planar heat spreader of FIG. 4, and may be provided with a step-like re-entrant feature 505 on the periphery to allow for better mechanical integrity of the structure with less delamination from the molding compound 527. 30 generally similar to that of FIG. 2, and like features are identified by like reference numerals. Particularly, the module 60 contains three die 214, 614, 624, in which in effect an inverted LGA package 602 having stacked die 614, 624 is stacked on a die 214 in a lower package 102. The lower die 214 is mounted on a substrate 12 in substantially the same manner as described above with reference to FIG. 2 by way of example and, as in the5 embodiment of FIG. 2, the lower die and its substrate may be supplied just as for a conventional package, but with no molding. That is, in the example shown here, the lower die 214 is mounted active side upward using a die attach epoxy 13 onto an upward-facing side of a BGA substrate 12, and the die is wire-bonded to wire bond sites on the upper metal layer of the BGA substrate. Solder balls 18 are mounted onto the downward facing side of the lower substrate to provide for second level interconnection with underlying circuitry as, for example, a motherboard (not shown). Thus the lower die and the lower substrate on which it is mounted can constitute a standard BGA package. Multiple such packages can be made in a strip or array. As in the embodiment of FIG. 2, in module 60 the spacer 222 is affixed using an adhesive 221 onto the upward facing (active) surface of the lower die 214. The spacer may be a solid piece, as shown here, which may be glass or a dummy silicon chip; or spacing may be provided by a spacer adhesive. As in the conventional stacked die package the spacer must be thick enough to provide sufficient standoff to accommodate the loop height of the bottom package wire bonds 216, and - where a solid spacer such as a dummy die is employed - the footprint of the spacer must be small enough that it does not contact the wire bonds at or near the die pads. The inverted LGA package 602 includes stacked first and second die 614, 624 separated by a spacer 622. The stacked die package 602 can be provided as a conventional stacked die package, as described generally with reference to FIG. 1. Referring to FIG. 6, first die 614 is mounted on a substrate 612 using a die attach adhesive 613, and the die 614 is electrically connected to the substrate 612 by wire bonds 626. Any of various substrate types may be used, including for example: a laminate with 2 - 6 metal layers, or a build up substrate with 4 - 8 metal layers, or a flexible polyimide tape with 1 - 2 metal layers, or a ceramic multilayer substrate. The substrate 612 shown by way of example in FIG. 6 has two metal layers on opposite sides of a dielectric, each metal layer being patterned to provide appropriate circuitry and connected through the dielectric by way of vias. The first die 614 is conventionally attached to a surface of the substrate using an adhesive, typically referred to as the die attach epoxy, shown at 213 in FIG. 6 and, in the configuration in FIG. 6, the surface of the substrate onto which the die is attached may be referred to as the "upper" surface, and the metal layer on that surface may be referred to as the "upper" metal layer, although the die attach surface need not have any particular orientation in use and, particularly, in the module according to the invention the stacked die package 602 is inverted, so that the die attach ("upper") surface of the substrate 612 is downward-facing. The spacer 622 is affixed to the active surface of the first die 614 by an adhesive 621 and the second die 624 is affixed to the opposite surface of the spacer 622 by an adhesive 623. In the stacked die package 602 of FIG. 6 the die are wire bonded onto wire bond sites on the upper (downward-facing when inverted in the module) metal layer of the substrate to establish electrical connections; wire bonds 626 connect the first die 614 to the substrate and wire bonds 646 connect the second die 624 to the substrate. The die 614 and 624 and the wire bonds 626 and 646 are molded (typically by array molding and saw singulation, to make a standard "chip scale package") with a molding compound 617 that provides protection from ambient and from mechanical stress to facilitate handling operations, and provides a surface for marking for identification. As will be appreciated, the wire bonds 626 in the stacked die package 602 have a characteristic "loop height", which (together with a loop height tolerance) is a parameter of the wire-bonding process, and sufficient spacing must be provided between the second and the first die 624, 614 to avoid damage to the wire bonds by impact with the second die. Accordingly, the spacer 622 is provided as a pedestal to support the second die 624 over the first die 614. The spacer is made narrow enough so that it does not impact the wire bonds at its edges, and thick enough to provide spacing sufficient to hold the second die above the wire loops; that is, the spacer itself does not impact the wires, and it provides sufficient distance between the first and second die so that the downward-facing side of the second die does not damage the wire bonds 626. The inverted package 602 is electrically interconnected ("z-interconnect") to the bottom substrate 102 by wire bonds 636, and the top package 602, the bottom die 214 and the spacer 222, the wires 236 and 216, and the die attach surface of the substrate 12 are encapsulated with a module encapsulant 627. One or both of the spacers 222 and 622 can be a solid material, such as a dummy silicon die or glass; or one or both of them can be an adhesive spacer, as described above with reference to FIG. 2. Solder balls 18 are reflowed onto bonding pads on the lower metal layer of the BGA lower package substrate (which constitutes the module substrate in the completed module) to provide interconnection to the motherboard (not shown) of a final product, such as a computer, for example, or a mobile communications device. Solder masks 125, 127 are patterned over the metal layers 121, 123 to expose the underlying metal at bonding sites for electrical connection, for example the wire bond sites and bonding pads for bonding the wire bonds 636, 216 and solder balls 18. In some embodiments of the invention, additional die may be stacked over the second (upper) inverted package, as shown in FIGs. 7 and 8. .5 package 102, separated by a spacer, generally as described above with reference to FIG. 2, and in which an additional inverted LGA package 902 is inverted and mounted upon the upward-facing side of the LGA package substrate 212. Certain features of the embodiment of FIG. 9 correspond to features in FIG. 2, and like features are identified by like reference numerals. The additional package 902 in this example is an LGA package; it includes a die0 924 mounted on a substrate 912 using an adhesive; the die 924 is electrically connected to the substrate 912 by wire bonds, and the die 924 and the downward-facing (upper) surface of the substrate 912 and the wire bonds are encapsulated in a molding 927. The additional LGA package 902 is electrically interconnected (z-interconnect) to the second (upper) package 202 substrate 212 by wire bonds 936, or is connected to the first (lower) package 1025 substrate 12 by wire bonds 946; or, the additional LGA package 902 may be electrically interconnected to both the second package substrate and the first package substrate, as shown for example in the FIG. FIG. 10 shows an example of a multiple chip module according to the invention generally at 100, in which an inverted LGA package 202 is stacked over a die 214 in a first BGA package 102, separated by a spacer, generally as described above with reference to FIG. 2, and in which an additional BGA package 1002 is mounted upon the upward-facing side of the LGA package substrate 212. Certain features of the embodiment of FIG. 10 correspond to features in FIG. 2 (and FIG. 9), and like features are identified by like reference numerals. The additional package 1002 in this example is a BGA package; it includes a die 1014 mounted on a substrate 1012 using an adhesive; the die 1014 is electrically connected to the substrate 1012 by solder balls 1018, reflowed onto ball pads in the patterned metal layer on the lower side of the substrate 1012, and the die 1014 and the wire bonds connecting it to the substrate 1012 are encapsulated in a molding 1017. The additional BGA package 1002 is electrically interconnected (z-interconnect) to the first (lower) package 102 substrate 12 by wire bonds 1036. Various semiconductor chips (die) can be employed in various combinations at the various places in the multiple chip modules according to the invention. For example, referring to FIG. 2, in one exemplary embodiment of the MCM according to the invention, the lower package can have a single die 214 which can be a processor, such as an application-specific integrated chip ("ASIC"), or a digital signal processor ("DSP"), or a graphics processor ("GPU"), or a central processing unit ("CPU"). In such modules, the upper package may typically be, for example, a memory package including one or more die 224 constituting a FLASH memory die (NOR or NAND type), or a SRAM, or SDARM, or MRAM, or DRAM, or DDRAM die, for example; or the upper package may be a stacked die memory package (constructed as shown for example in FIG. 6) including a combination of one or more types of memory die 614. 624. Or, for example, referring again to FIG. 2 and FIG. 12 in another exemplary embodiment of the MCM according to the invention, the module can be a memory module, in which the lower package can have a single die 214 which can be a memory die such as a DRAM die, or a stack of die 214. 1214 which can include one or more memory types. In such embodiments the inverted upper package can have one or more die (224 in FIG. 2, 614, 624 in FIG. 6) of one or more memory types, typically the upper package is a FLASH memory package or a package having a combination of FLASH and other memory types. According to the invention, an advantage is realized in combining memory types, because different memory types are typically supplied by different vendors, and are tested using different testing methods and criteria. Where, for example, the lower package die is a DRAM die, and is supplied as a "known good die", its performance parameters change when the die is mounted onto the substrate, and a lower package including such a die should preferably be retested before it is used on a multiple chip module having the DRAM die together with other memory (or other type) die. Such testing is facilitated according to the invention. In modules as illustrated for example in FIG.8, the lower package die 214 may be a processor, such as a CPU or a DSP or a GPU, for example; and the inverted package die 224 and the additional die 824 may be memory die; for example, one of the die 224 and 824 may be a very fast memory device (such as a DDR or DRAM die), and the other may be a nonvolatile memory device (such as a FLASH memory die). In modules as illustrated for example in FIG. 9, the additional package 902 can be a BCC or a QFN or a tape-substrate based LGA package. These all are referred to generally herein as "LGA" packages, although a conventional LGA package usually includes an area array as well as a peripheral array of interconnection pads (as illustrated for example in FIG. 3B and conventional BCC or QFN packages may have only peripheral pads for interconnection. An advantage of modules as illustrated for example in FIG. 10 is that the additional BGA package 1002 can be a conventional BGA package, such as an off-the-shelf BGA memory package. This can readily and flexibly be incorporated into the module according to the invention as the particular end application may require. In some embodiments of the invention, an additional stacked over the second (upper) inverted package may be a photosensor die (such as an imaging die), as shown in FIG. 11. 5 the die 1214 is affixed to the upward-facing surface of the spacer 1222 by an adhesive 1223. An inverted package 202 is mounted over the die 1214 and is separated therefrom by a spacer 222. The spacer 222 is affixed to the upward-facing surface of the die 1214 by an adhesive 221 , and the package 202 is affixed to the upward-facing surface of the spacer 222 by an adhesive 223. The inverted package 202 is interconnected by wire bonds 1236 to the substrate 12, and the module is encapsulated in a molding 1227. FIG. 13 is a flow diagram showing steps in an assembly process according to the invention for making a module as in FIG. 2. The lower die is attached to and wire bonded to the lower substrate in steps 1301, 1302, 1303 and 1304. The spacer is affixed over the lower die in steps 1305 and 1306. The inverted upper package is affixed over the spacer in steps 1307 and 1308. A plasma clean step 1309 is performed to prepare the wire bond sites for z-interconnect wire bonding 1310, followed by a further plasma clean 1321 to prepare all the surfaces for good adhesion of the molding. Molding is then introduced and cured, in steps 1322 and 1323. Then the solder balls are attached, 1324, and the modules are singulated from the strip, 1325. FIG. 14 is a flow diagram showing steps in an assembly process according to the invention for making a module as in FIG. 4, having a heat spreader affixed onto the upward facing side of the upper package. The process up to the point of completion of the z-interconnections, steps 1301 through 1310, is similar to the process of FIG. 13. Here, following z-interconnection, an adhesive is dispensed on the upward facing side of the upper LGA package, and the heatspreader is placed onto the adhesive, step 1411, and then the adhesive is cured, step 1412. There follows a further plasma clean 1421 to prepare all the surfaces for good adhesion of the molding. Molding is then introduced and cured, in steps 1422 and 1423. Then the solder balls are attached, 1424, and the modules are singulated from the strip, 1425. FIG. 15 is a flow diagram showing steps in an assembly process according to the invention for making a module as in FIG. 5, having a heat spreader embedded in the molding over the upper package. The process up to the point of completion of the z-interconnections, steps 1301 through 1310, is similar to the process of FIG. 13 or FIG. 14. Here, following z-interconnection, the heatspreader is dropped into the mold cavity, step 1511. The stack is placed over the heatspreader in the cavity and molding is then introduced and cured, in steps 1522 and 1523. Then the solder balls are attached, 1524, and the modules are singulated from the strip, 1525. The methods employ established manufacturing infrastructure, and can provide lower cost of manufacture as compared to alternative stacked package structures that require new methods and tools. Modules made according to the invention can have lower cost than comparable stacked die packages (that is, stacked die packages containing similar sets of die), owing to the fact that according to the invention the upper die can be tested in their respective upper packages prior to assembly, and only those packages tested as "good" are selected for further processing. Materials and processing waste are accordingly reduced. Also, modules according to the invention can be more reliable than comparable stacked die packages, because the upper packages employed in the invention can be subjected to more rigorous reliability tests than can the stacked die package; particularly, a memory "burn-in" test can be performed where the upper package contains a memory die. Also, packaged die can be more readily sourced from different suppliers than bare die; even more difficult to obtain, and significantly more expensive, are Known Good Die. The use of wire bonding for the z-interconnect in the modules of the invention provides an additional advantage over stacked package technologies that employ other z-interconnects between stacked packages. Wire bonding is well established in the industry and has the lowest cost structure. Because the wire bond process is programmable it provides has high flexibility in response to design changes; and it allows for lower cost substrates and assembly tooling. The fine pitch nature of wire bonding, currently at 50 micron pitch, allows a high number of interconnects between the LGA and the CSP substrate. That capability often translates into high performance and design flexibility. The spacer adds further flexibility to the design. The spacer technology allows for a significantly larger LGA to be assembled on top of a smaller die, and this can be of high value particularly in applications where the lower die is a memory, that usually is a larger die. Where the lower die is a processor with large I/O running at high frequency, the die usually is smaller and must be on the bottom to insure short wire lengths, which is very desirable for their low inductance that allows for high electrical performance. All patents and patent applications referred to above are hereby incorporated by reference herein. Other embodiments are within the following claims. For example, one or more of the packages in the multiple chip module may be a short range radio package, such as a so- called "Bluetooth" package, which may include one or more radio frequency chips and one or more passive devices, providing short range wireless interconnection for the functionality of the various devices in the multiple chip module. 1. A multiple chip package module comprising an inverted package stacked over a die. 2. A multiple chip module, comprising stacked first and second packages, each package including a die attached to a substrate, in which the upper package is inverted, and in which the upper package is stacked over a die on the lower package with provision for spacing between the upper package and the lower package die. 3. A multi-package module comprising stacked first and second packages, the first package being a BGA package having a die attached to a substrate and the second package including a die attached to a substrate, wherein the second package is inverted so that the substrate surface to which its die is attached is downward-facing, and in which the inverted package is affixed over the first package die, with provision for spacing between the first package die and the inverted second package. 4. The multi-chip module of claim 3 wherein the second package is an LGA package. 5. The multi-chip module of claim 3 wherein the second package is a saw-singulated package. 6. The multi-chip module of claim 3 wherein the second package is a chip scale package. 7. The multi-chip module of claim 3 wherein the second package has a tape-based package substrate. 8. The multi-chip module of claim 3 wherein the second package is a bump chip carrier package. 9. A multiple chip module, comprising a second package inverted and stacked over a die on a first package. 10. The module of claim 9 wherein the first package comprises a BGA package. 11. The module of claim 9 wherein the first package includes at least one die mounted on a substrate. 12. The module of claim 9 wherein the first package die is connected to a first package substrate by wire bonds, and wherein a spacer is affixed onto the upward facing side of the die, and wherein the inverted package is affixed onto the upward facing side of the spacer. 13. The module of claim 9 wherein z-interconnection between the inverted package and the first package is wire bond based. 14. The module of claim 13 wherein wire bonds connect z-interconnect wire bond pads on an upward facing side of the inverted second package with pads on the lower package die. 15. The module of claim 13 wherein wire bonds connect z-interconnect wire bond pads on an upward facing side of the inverted second package with z-interconnect wire bond pads on the upward-facing side of the first package substrate. 16. The module of claim 13 wherein wire bonds connect z-interconnect wire bond pads on an upward facing side of the inverted second package with z-interconnect wire bond pads on the upward-facing side of the first package substrate, and wherein wire bonds connect z- interconnect wire bond pads on an upward facing side of the inverted second package with pads on the lower package die. 17. The module of claim 3 wherein the connection of the second package die and the second package substrate is by flip chip or wire bond interconnection. 18. The module of claim 3 wherein the inverted second package comprises a laminate substrate LGA. 19. The module of claim 3 wherein the inverted second package comprises a tape-based LGA. 20. The module of claim 3 wherein the inverted second package comprises a QFN package. 21. The module of claim 3 wherein the inverted second package comprises a BCC package. 22. The module of claim 3 wherein the inverted second package comprises at least one die. 23. The module of claim 22 wherein the inverted second package comprises a plurality of die. 24. The module of claim 22 wherein the inverted second package comprises a plurality of stacked die. 24. The module of claim 3 wherein the first package comprises at least one die. 25. The module of claim 3 wherein the first package comprises a plurality of die. 26. The module of claim 3 wherein the first package comprises a plurality of stacked die, and wherein inverted second package is mounted over an uppermost one of the stacked die. 27. The module of claim 3 wherein the first package comprises a flip chip die bonded to the first substrate. 28. The module of claim 3 wherein the first package comprises a flip chip die bonded to the second substrate. 29. The module of claim 3, further comprising a heat spreader over the second package. 30. The module of claim 3, comprising a laminate substrate. 31. The module of claim 3, comprising a build-up substrate. 32. The module of claim 3, comprising a flexible substrate. 33. The module of claim 3, comprising a ceramic substrate. 34. The module of claim 3, further comprising an additional package mounted over the inverted second package. 35. The module of claim 34 wherein the additional LGA package is wire bonded to the inverted second package substrate. 36. The module of claim 34 wherein the additional LGA package is wire bonded to the first package substrate. 37. The module of claim 3, further comprising an additional die mounted over the inverted second package. 38. The module of claim 37 wherein the additional die is wire-bonded to the upper package substrate. 39. The module of claim 37 wherein the additional die is wire-bonded to the lower package substrate. 40. The module of claim 3, further comprising a heat spreader. 41. The module of claim 3 wherein the heat spreader is affixed to an upward facing surface of a topmost package. 42. The module of claim 3 wherein the heat spreader is affixed to an upward facing surface of an additional die on the second package. 43. The module of claim 3 wherein the inverted second package is the uppermost package in the module, and wherein the heat spreader is affixed to an upward facing side of the inverted second package. 44. The module of claim 3 wherein the heat spreader is molded in at the topmost surface of the module. 45. The module of claim 3 wherein an electrically nonconductive heat-conducting molding is employed for a module encapsulation. 46. A method for making a multiple chip package modules having an inverted package stacked over a die, comprising providing a first package having a first die attached onto an upward facing side of a first package substrate, and stacking an inverted second package over the die on the first package, provision being made for a standoff between the second package and the first package die to avoid damaging impact between the downward-facing side of the second package and wire bonds connecting the first die to the first package substrate. 47. A method for making a multiple chip package modules having an inverted package stacked over a die, comprising attaching a first die to a first substrate, wire bonding the first die to the first substrate, affixing a spacer over the first die, affixing an inverted upper package over the spacer, performing a first plasma clean to prepare wire bond sites for z-interconnect wire bonding, carrying out z-interconnect wire bonding, performing a second- plasma clean to prepare surfaces for good adhesion of a molding, introducing and curing the molding, and attaching solder balls. 48. The method of claim 47, further comprising, following the z-interconnecting, dispensing an adhesive on an upward facing side of the second package, placing a heat spreader onto the adhesive, and curing the adhesive. 49. The method of claim 47, further comprising, following the z-interconnecting, placing a heat spreader into a mold cavity, placing the assembled inverted package affixed over the first die over the heat spreader in the cavity, introducing a molding compound into the cavity, and curing the molding compound. 50. A computer containing a multiple chip package module a having an inverted package stacked over a die. 51. A portable electronic apparatus containing a multiple chip package module having an inverted package stacked over a die. 52. A mobile telecommunications device containing a multiple chip package module having an inverted package stacked over a die. FR2670322B1 (en) * 1990-12-05 1997-07-04 Matra Espace memory modules and solid state memory devices comprising such modules.